From May 29th to June 8th, my best friend from high school, Jenna, came out to Marburg to visit. Early on in our planning process, we decided we had to visit Sweden. For Jenna, it was visiting the home of her grandparents, and for me, it was just an opportunity to see a cool new part of Europe. We departed for Stockholm on the evening of June 2nd, a Thursday. We had the distinct pleasure of NOT having to fly RyanAir, as we had waited so long to book the airfare that the price of the budget airlines was almost the exact same as that of the more respectable Lufthansa. Oh darn! Looks like we’ll have to fly out of a real airport on a real airline. It was somewhat surreal being back in the main Frankfurt airport (recall that RyanAir flies out of the deceptively named Frankfurt Hahn Airport, which is in fact nowhere near Frankfurt), since this was the first time I had been there since I first arrived in Germany at the end of February. The downside of finding reasonably priced airfare via Lufthansa was that our flight would not get into Stockholm until about 11:50 p.m. So we arrived in Sweden fairly tuckered out but still with a journey ahead of us. We hopped on a shuttle bus to the city center, arriving around 12:45 a.m., and then we tried to navigate to our hotel. It was really only a 20 minute walk from the central terminal to our hotel, but we quickly found that the directions from the hostel were less than precise. We didn’t end up settling into bed until close to 2 a.m. Yikes! One thing that was quite weird as we were walking around was that the sun had not totally set, even so late at night/early in the morning, since Stockholm is so far north. The sky was dark, yes, but there were still bits of light on the periphery. That made the walk to the hostel somewhat disorienting, since our bodies were telling us we should be exhausted, but the sky itself seemed to be telling us the night was only beginning. 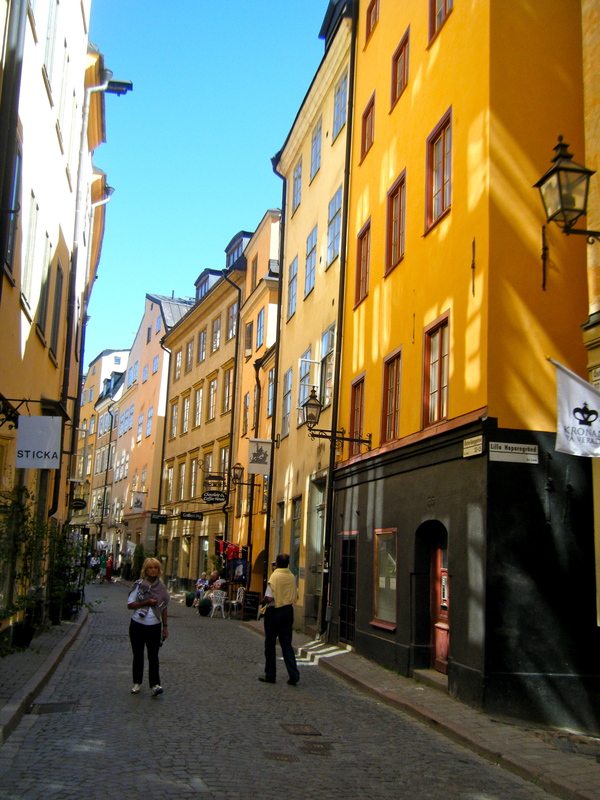 The streets of Gamla Stan, Stockholm's old city. We roused the next day/later in the morning around 8:30 a.m. Upon waking up I was immediately startled to be greeted with a familiar exclamation of “Tori!” in my hostel room from my Marquette roommate, Angela. She was going to meet Jenna and I in Stockholm, but when she had contacted the hostel in advance, they had told her it was not possible to be placed in the same room as the two of us. But by some stroke of luck we ended up in the same hostel room anyway! Jenna and I rallied our stamina, having only slept about six hours, and began the sightseeing. It was quickly apparent that we had chosen well in our hostel—it was located right across from the water in Stockholm’s Old Town, called Gamla Stan. This put it firmly in the middle of Stockholm itself, making it easy to walk to the north or south, or to take a ferry to a neighboring island. The city itself certainly lived up to any picture I had ever seen of it. 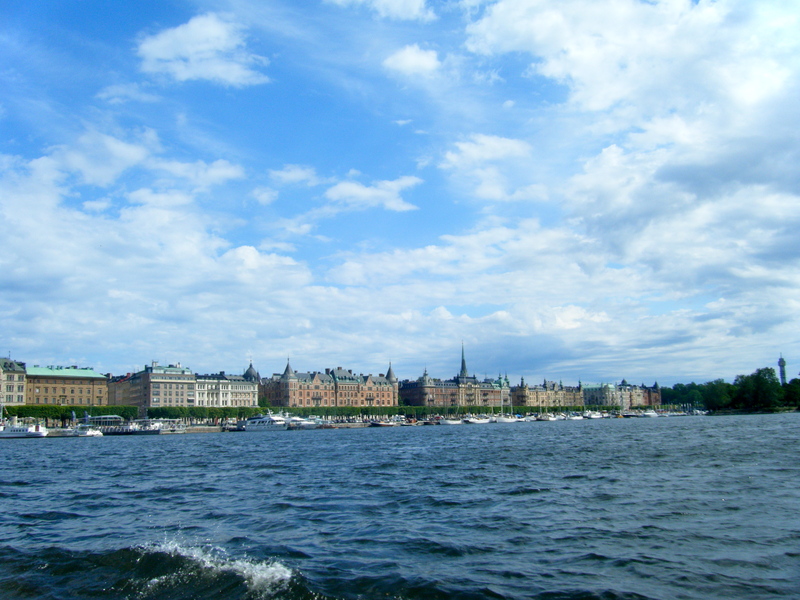 Stockholm is a lovely seaside city. The old town was as picturesque and charming as anything I have seen in Europe, with the classic, winding cobble stone streets and brightly painted buildings. That was one thing that stood out to most in Stockholm—everything just seemed so colorful and bright. Another aspect of Stockholm that also became quite apparent was that it is a terribly expensive city. Our hostel was not bad at 25 euros a night, but a standard meal at an average restaurant would cost at least $20, a beer $7-$10. That can add up quickly! Friday was just a day for general sightseeing, with an early bedtime. Saturday, we roused for round two. 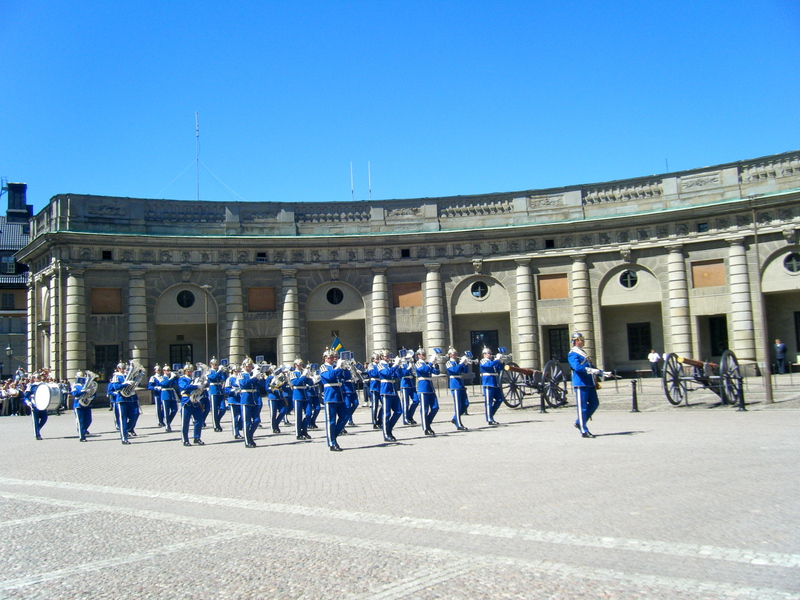 Our first main sightseeing venture was the changing of the guard at the royal palace—I had sort of forgotten that Sweden had a royal family to begin with, but Sweden clearly has not. There were souvenir shops full of merchandise bearing their faces as well as Swedish shopkeepers eager to talk to us about the king’s philandering reputation. But anyway. Changing of the guard ceremony at the royal palace. The ceremony was quite impressive, I thought, mostly because of the band. They sounded phenomenal and had excellent choreography. They played for nearly 20 minutes, which was much longer than I would have expected for a ceremony that happens every day. We arrived early enough to get great vantage points, and it was definitely worth standing in the beating sun for 40 minutes. That evening, we did something quite different but equally touristy—visit the Absolut Ice Bar. If you’re not familiar with the concept, an ice bar is exactly what it sounds like: a bar made of ice. Everything, from the tables and chairs to the drink glasses, is sculpted from ice. Admission was about $25 for one drink and the parkas (it’s cold in there! ), but it was worth the money, in my opinion. A gimmicky but still very cool (har) concept. On Sunday, Angela and I took one of the hop-on, hop-off boats to Djurgården, an island that houses, among other things, Skansen, which was a sort of nature park/outdoor museum/zoo thing. The park serves as a window into Swedish history, with replicas of storefronts from the 1800s and 1900s, as well as mock settlements of the ancient nordic tribes, the Sami. They also had enclosures featuring native Swedish wildlife, such as reindeer and wolverines. 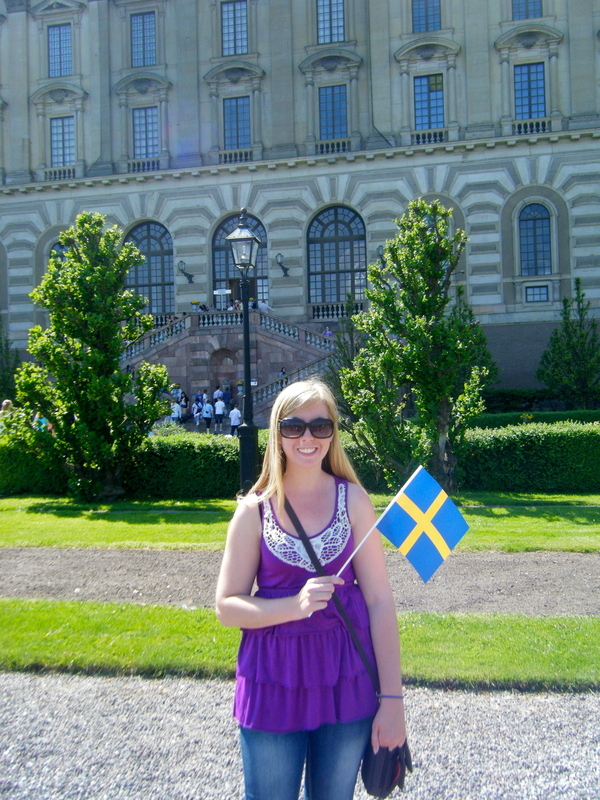 We returned mid-afternoon and headed to the Nobel Museum, where Jenna joined us. The museum was much smaller than I expected, but still very interesting. We joined a guided tour, which was extremely informative. One thing I learned that I thought was particularly cool is that each laureate receives a sort of booklet/diploma that is designed specifically for them and their award; the artwork on this is usually somehow inspired by the work that the laureate did to receive the award. Beyond the basic information about the award and the ceremony, the rest of the museum was just a collection of displays featuring different items somehow relevant to specific laureates and their work. Happy National Day of Sweden! The next day, Monday, was our final day – we were flying back that evening. However, we were able to take a little time to enjoy the atmosphere, for we just so happened to be in Sweden on their flag day, which is their main patriotic holiday. Everyone was walking around with little Swedish flags (we acquired some of our own, naturally), and there were all sorts of ceremonies and celebrations happening. I do wish that we could have had more time to take it all in, but unfortunately we didn’t have a lot of time before we had to gather our things and head to the airport. Despite how expensive everything was, I really enjoyed my trip to Stockholm. It’s a beautiful city that provides a nice change from the style and mood of the German cities I’m so used to seeing. Moreover, all the people we met were quite nice and spoke incredible English. They almost made me not feel bad for speaking English everywhere. Almost. That’s still something that’s hard for me to get used to though, since when I’m in Germany I’m at least marginally competent wherever I go. Stockholm was a successful first foray into Scandinavia, but not my last. Tune in next week/whenever I have time to type up another blog post to see how my next northern European adventure went. Destination: Copenhagen!